Worldwide, childhood obesity is a problem, and in South Africa, in particular, this is a major concern. Registered dietician Linda Drummond tells us how you can ensure your children are not affected by this global epidemic. No parent decides that their child should be overweight or even obese. Yet in South Africa, around one in seven children between the ages of six and 14 years is either overweight or obese. We know that this doesn’t begin at primary school age, but rather much earlier, and so what happens from birth and even before birth can have a significant impact on your child’s weight and overall health. Some believe that children will outgrow ‘puppy fat’, but this is not necessarily true. Unhealthy weight gain at an early age can increase your child’s risk of being overweight in adolescence and even in adulthood. The immediate consequences of this can include less participation in physical activity and being teased by others at school, while intermediate and long-term effects include risks for and development of chronic diseases. If your child is overweight or obese or you simply want to prevent this from happening. Try these tips to address or prevent unhealthy weight gain. It has been said that, “The best way to encourage your child to be the adult you’ve dreamed of is to become the type of adult you would like her to be,” or, “Take a ‘do as I do’ and not ‘do as I say’ approach.” Children look to their parents as role models in every way. Your own lifestyle needs to reflect a healthy one so that your children will adopt this too. If this is something that you require support with, visit appropriate professionals such as registered dieticians for nutrition and diet advice, or personal trainers for physical activity. Which food and drinks are served. When you eat and serve a variety of healthy foods, your child will learn to eat these foods too. When the food is served. When children eat at set times they are more likely to come to the table hungry and try new foods. Where food is served. Children will eat healthier foods when you eat together at the table. If and how much to eat from the food and drinks you have served. While our busy lives make this a challenge, making time to eat together as often as possible helps to teach your child healthy eating habits. This only works if all family members are committed to eating healthily together. For younger children, significant members of the family such as older siblings or friends can have a big influence and can either help promote a healthy lifestyle or discourage it. 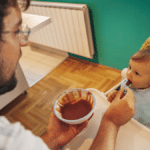 Babies and children need guidance, not control, when it comes to eating by recognising their hunger and fullness cues and feeding them appropriately, so that these cues can be preserved. Try to avoid pressuring your children to eat, and provide treats in the right context and amount. When it comes to comforting your child or rewarding them for good behaviour, try to find alternatives that don’t have a negative impact on their health. For example, give them a hug and extra attention when they need comfort or reward them with extra outdoor play, story or bath time. Your time and attention will always outweigh anything you can give your child. Using food as reward increases the desirability of these foods, and decreases the liking of healthier foods. Breastfeeding exclusively (no other food or drinks) for six months brings benefits to babies through healthy weight gain in both childhood and beyond. You can also influence a child’s food preferences by what you eat during breastfeeding. 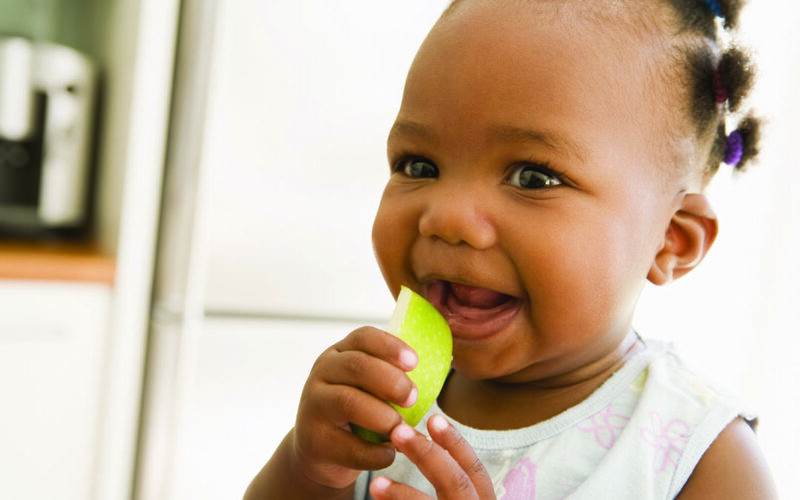 Research has shown that introducing solids too early is a cause of obesity. It’s important to recognise when your baby’s distress is due to needs other than hunger, and develop tactics other than feeding to calm her. The types of solids introduced are key too, as this will influence your child’s weight gain and food preferences. For example, a high protein intake in the first two years of life has been linked to obesity at school-going age. Babies and children don’t need the same portions as adults. It is important to find out what the appropriate portions are for your child’s age and provide these, bearing in mind that, if you are responsive to your child, sometimes they will eat less and sometimes more. Avoid using adult plates for younger children as this encourages inappropriately large portions. Avoid bringing foods that are high in energy and low in nutrients into your home. This helps promote better nutrient intake, diminishes arguments and also decreases the need for enforcing restraint. If you feel that you are reliant on ready-prepared meals, consider attending a cooking class to learn how to pre-prepare meals so that you control what they contain. Encourage children to drink water and milk and limit their consumption of juice, sweetened milks and other sweetened beverages. Create an environment at home that allows your child to take part in active play and provide alternatives to screen time. 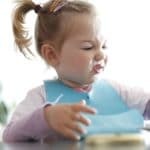 Studies show that excessive screen time has been linked to negative effects on behaviour, academic performance, language development as well as obesity. The American Academy of Paediatrics recommends no TV for children under two years, less than two hours of screen time per day for over two years, with no TV while eating and no TV in bedrooms. Establish good sleep patterns as early as possible and ensure that your child gets the right amount of sleep. Children under five years need at least 11 hours per day, children between five and 10 years need at least 10 hours, and children older than 10 years need at least nine hours.